Those Mormons just don’t give up do they? Newly divorced horror writer Roger Cobb (William Katt) moves back to his former home to break a crushing case of writer’s block that has beset him ever since he commenced work on a highly personal work detailing his experiences of war in Vietnam. It happens to be the same home where his young son vanished some years prior, and also where his Aunt more recently hung herself, leading to rumours that this particular residence might be haunted. In my mind House can’t escape comparisons with the first two Evil Dead films, the various monsters and effects are obviously created by the same people such are the similarities, and the numerous creepily humerous touches are strongly reminiscent of those classics. The primary difference is the lack of a Bruce Campbell leading man, though Katt gives his all and is obviously a good sport, he lacks the charisma, the mugging and the knack for physical comedy that granted Campbell an enduring career in B movies. Katt’s Cobb suffers from visions and delusions that are both interactive and communicative. The House boasts a number of unnerving elements that would prompt some creative cover-ups from a real estate agent. There is an especially punctual monster in his closet that visits at the same time nightly, living taxidermy on the den wall, a hungry swimming pool and animated garden tools in the shed. The non-residents of the home aren’t particularly helpful either, his neighbour Harold (George Wendt) might be his #1 fan, but he isn’t especially smart and most definitely lacks even basic powers of perception, as is the norm in these films cops are gormless idiots capable of breaking a cracker let alone a case, and while his other-side neighbour is undeniably hot she provides Roger with little else bar untimely ocular amusement. There ultimately is a reason behind all the silliness and goings on in the Cobb household, but the main reason to hang around is to mildly entertained by an early horror-comedy that managed to get the mix just about right, without the gross outs and mean spirited stuff that stymie more recent efforts. Final Rating – 7 / 10. 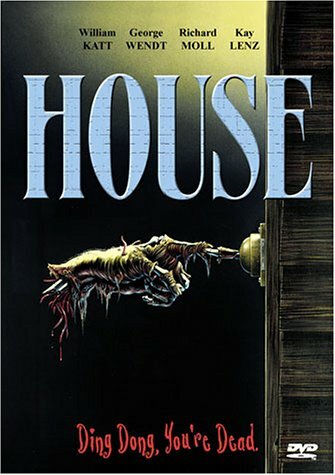 House isn’t especially scary, it isn’t even that funny aside from a couple decent moments, but it stands alongside The Gate, Fright Night and The Blob as decent and mostly overlooked 80s horror flicks.